Halo 5: Guardians may be one of the most anticipated upcoming exclusives right now for Microsoft. The follow-up to Halo 4 and the second in a new trilogy, it has quite a franchise to live up to.There’s a lot of expectations and standards for a Halo title’s multiplayer – many past titles have fallen prey to not capturing the same spirit the original Halo trilogy did in its arena shooter. I got a chance to play the beta during the recent early launch event, and see if Guardians will bring some of that original charm back to the franchise. The build I played featured only one mode, the team variant of the classic Slayer, and two maps. One, dubbed Truth, is a re-imagining of Midship, a pretty popular Halo 2 map. The other, Empire, is a symmetrical battlefield reminiscent of several previous games’ map designs, with plenty of elevated platforms and sniper’s alleys. The guns feel as solid as they always have, and smart-scoping adds new life to weapons commonly looked over like the Assault Rifle. Truth’s point of contention was the Prophet’s Bane, a Covenant energy sword that had an odd white shimmer instead of the classic blue. Spawning at the top of the map, the team received alerts every time power weapons were going to be replenished. Also making a return is the map callouts over your radar, allowing you to easily say your position on the field and alert others to threats in nearby areas. Empire had two Sniper Rifle spawns on either side, and while Truth’s sword saw a mild bit of struggle, the Sniper Rifles created a mad dash for the power weapon spawn areas. While the Sniper Rifle was as powerful as it ever was, it was also very representative of the new direction for the weapons. Midship is back, and the contest for control of the sword spawn in the center makes Slayer pretty hectic. The gun models are beautiful, and most guns feel the same as they did in previous titles. 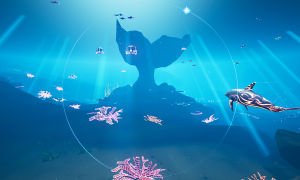 The actual size of the models on-screen, however, is gigantic. It often felt like I was struggling to see anything on the right side of my screen. If I was holding a rocket launcher that might make more sense, but even with the Assault Rifle and DMR I constantly felt like I had to rely on my motion tracker for any threats to the immediate right of me. The first thing I noticed, when entering these matches, was the focus on the maps themselves. Each map gives you a slow overview of the main areas of contention before jumping you into the match, and reminds you of the power weapons you need to control. No more Ordinance Drops, no more loadouts (at least not in the beta), the focus is back on weapon spawns and area control, a welcome change of pace from recent Halo multiplayer. Each team gets their own “entering the arena” cutscene, and then its off. Assault Rifle in one slot, Pistol in the other, I was ready to dominate. While there’s sure to be plenty of weapons to pick-up and fight over, the pistol remains a trusty failsafe. A big change that’s caused some controversy has been the addition of smart scopes. Some like to refer to this mechanic as ADS, or aim down sights, a technique used frequently in Call of Duty and other shooters. Halo has always been about the hipfire, so fans are upset when they hear ADS is being implemented for traditional spray-and-pray weapons like the Assault Rifle. Smart scopes are a bit better than that, though. 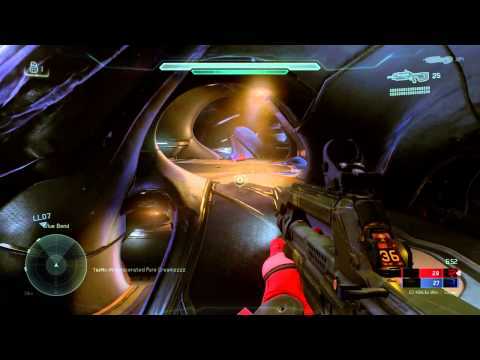 Giving an artificial zoom to your vision, aiming down your smart scopes on weapons like the Assault Rifle allows you to see a bit farther when aiming, at the cost of mobility and field of view, much like the binoculars of previous Halo games. You’ll also get de-scoped if hit by enemy fire, just like with the Sniper Rifle or Battle Rifle. It creates a nice tradeoff, where I was often questioning whether losing the ability to quickly strafe oncoming bullets was worth the mild boost in accuracy. Sometimes it’s smarter to take things slowly rather than carelessly abusing the newly-unlimited sprint. And in Guardians, it is all about the mobility. To clear something up initially, mobility and speed are two different things; another nerve for series mainstays is that Halo might be trying to make itself a faster game, another sign of potential “CoD-ifying.” The additions to the Spartan’s moveset don’t add speed, but rather versatility to what used to be a very rote arsenal of movement options in a firefight. Thruster packs now replace armor abilities, so you’ll never have to deal with invincible ground pounds and a certain idiot (me) floating in the air with a jetpack lobbing plasma grenades. Thrusters allow quick bursts of movement forward, backward, left or right, either while in the air or on the ground. Being able to jump into a fight and thruster back to dodge a few shots, or strafe right to avoid a grenade, is fantastic. Along with that, clamber allows you to grab onto ledges and hoist yourself up, allowing previously unreachable platforms to become your brand new sniper’s nest. Jumping off a platform to thruster up and clamber to a new one feels fluid and natural, and by the end of the first match I was asking myself how they weren’t added to the series sooner. Thrusters offer players the ability to make clever maneuvers mid-firefight, though they take a while to charge between uses. The new thruster packs also bring a host of options for offensive combat as well. You can ground pound from the sky, destroying some poor soul who forgot to look up as you hovered over them. You can also hover midair for a short time by scoping, allowing you a few extra seconds to line up that perfect shot, and creating some amazing moments with the Sniper Rifle. Fancy movement comes with a cost, however. Sprinting is now unlimited, but it also disables your shield regeneration for a short time. Thrusters are effective at dodging left and right, but each successive thruster will have to wait on a cooldown timer. Guardians’ multiplayer seems to be about checks and balances, allowing new freedoms while also not letting them dominate the classic playstyles. You’ll still toss a grenade before emptying an Assault Rifle clip, and the Pistol is still the sharpshooters’ favorite sidearm, but now there is a host of new options to add to the mix. The weapon models look gorgeous, while still retaining their trademark aesthetic. Enhancing, not erasing, the old-school charm of Halo, Guardians already looks to be a great new addition to the series. The beta only contained two maps, one mode, and mostly the standard UNSC set of weapons, but it was enough to whet my appetite for new Halo multiplayer. Hopefully it continues to shape up well as it heads into full beta release at the end of the year.